Spring has arrived Fancy Friends (okay – the first day of Spring has arrived… I know many of us are still seeing snow fall)! We are loving colored sugar cookie dough in bright hues for spring and Easter. 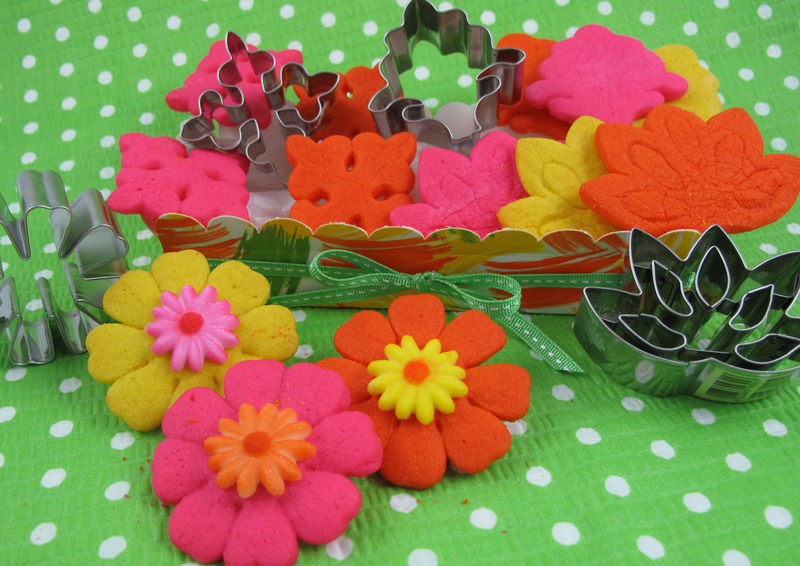 These fun cookie shapes were cut with our NEW Historical Collection German Flower Cookie Cutters. Made of stainless steel, this series of rugged cutters has beautifully detailed inserts which will emboss the features directly on the cookie – making them perfect for using colored dough to show off their unique look! Of course just dying the cookie dough is never enough at Fancy Flours, so we added these cute sugar daisies in bright colors to match and attached them with a dab of icing. Check out our step-by-step colored dough sugar cookie recipe and other how-to’s HERE. If you are coloring the dough anyway – then why not make a few of your cookies shimmering cookie-pops?! You just need lollipop sticks and a luster or sparkle dust in your favorite color. Stick the lollipop sticks into your cookies prior to baking them and make sure the stick has dough all the way around it. In other words – don’t just lay the cookie on top of the stick and then put in the oven. The stick won’t stay attached to the cookie after it is done baking unless you press the dough around the back of the stick. After baking we added a little glimmer by mixing luster or sparkle dust with clear vanilla extract (lemon works well too) to create a paint. Then paint the dust on as you wish with a craft paintbrush. 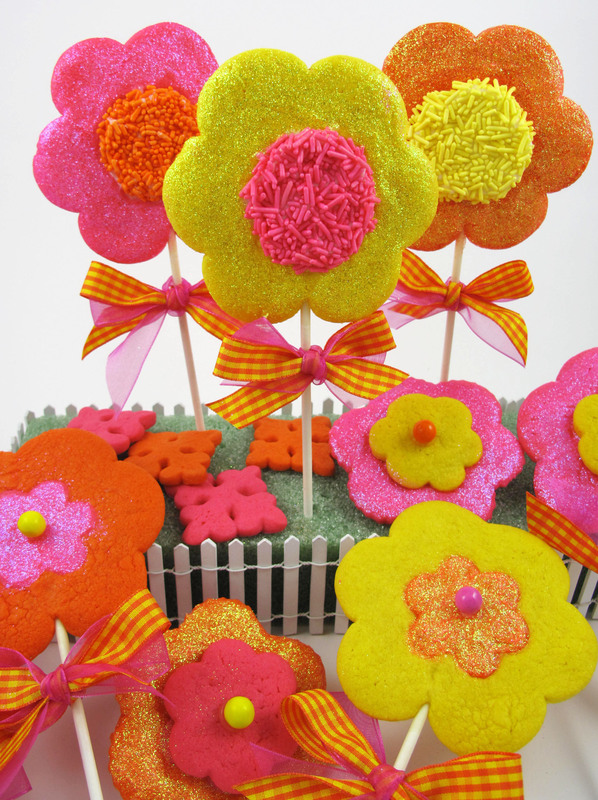 Try using sprinkles or our new sixlet style candies for an extra punch of color in the centers of the flowers. We finished the look with orange gingham check ribbon and sheer fuschia ribbon. Hooray for spring baking projects! This entry was posted in Cookie Recipes & Ideas, Recipes & Tips, Spring Baking by Fancy Flours. Bookmark the permalink. I missed the first tutorial. How can I view it? Is there a recipe included?